Open worldwide to post-secondary and high school students in creative advertising, graphic design, interactive media, photography and illustration programs, the Applied Arts Student Awards is the largest and most respected show of its kind in North America. Applied Arts is a highly-regarded visual communications magazine founded in 1986 in Canada. 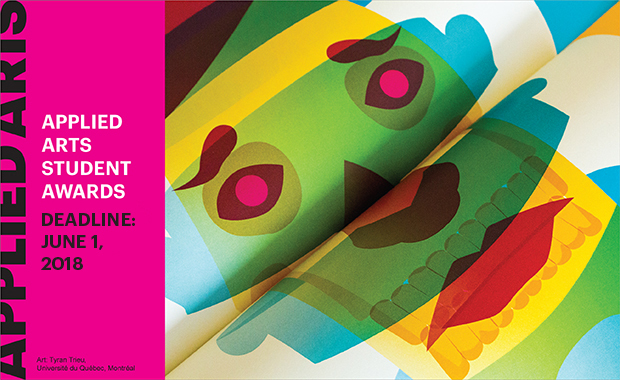 Winning an Applied Arts Student Award is a great way to launch your career. Your submissions will be judged by a jury of 12 award-winning senior communications professionals, so you’ll know how your work stands up according to the highest standards in the industry. What makes Applied Arts Awards unique is that winners are not ranked against each other. Each entry is judged individually and independently by each jury member. Work is given a score of 1 to 10, and all pieces that are judged to be at or above the cut-off score will be published as winners in the Awards Annual. Open worldwide to post-secondary and high school students. High school students may only apply to the High School categories. The rest of the categories are for post-secondary students. Any work completed as a school requirement or work completed independently during the course of your studies is eligible for entry. And even if you graduated within the last year and the work that you are interested in submitting to the Student Awards 2018 was not submitted to last year’s Student Awards, then you are still eligible to enter. Instructors can make group submission on behalf of their students. You retain all rights of your images.